« Yes, It Does Snow in Seattle! As of a few hours ago the Wheel turned once more and we moved from the waning light to its joyous return. In a few days we’ll be able to see that the days are starting to get longer, something which every gardener longs for at this time of year. We have few plants to enliven our gardens with color now tho a few things do bloom still. But mostly it’s the time of evergreens, and so we decided to do something a bit different as well as our usual house lights and the Holiday Tree and all. 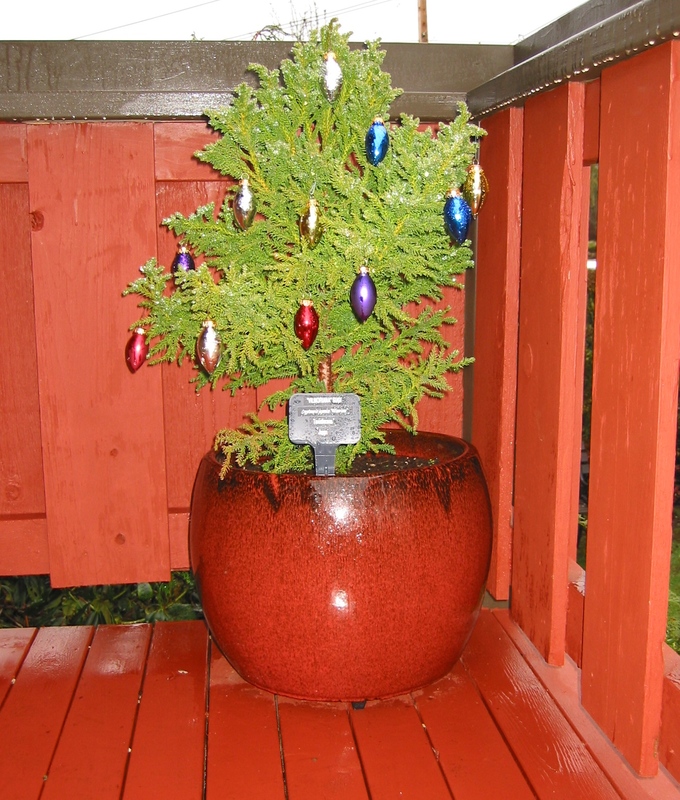 This year we decorated the little Cryptomeria Vilmoriana on our front porch. It greets all out visitors as they come up the steps to our front door. I think it looks great with the little bulbs on it. Not the usual tree to decorate but who cares? It still works for us. I hope you’re all enjoying this relative down time for us gardeners and relish the seasons delicacies that still turn up now and then. Like the “Charity” Mahonia I have that’s been blooming its bright yellow flowers for months now it seems. And the Winter Daphne that’s just starting to bud out in preparation for its so fragrant blooms. I’m ready for a change already and it’s just Solstice today. I guess I’m impatient, but then I know I’m not really. I just love to see things growing and find the fallow time more difficult. Going within to the darkness of winter is always hard on me and I miss the ability to put my hands in the dirt as often as I’d like to. Time to get into the greenhouse and work there I guess. So I wish you all a very Merry Solstice and a Happy New Year, and hope that all your gardening dreams come true for you this year. It’s a special time of openness and it’s good to be open to what Nature has to offer, even in this season of cold and darkness. There’s still the Return of the Light and it’s happening now. So go enjoy it! And a wonderful xmas and new year to you both, Steve. Nature opens and then gives. Thank you. Nature is my Temple and my Sanctuary. She gives me so much when I need it the most. I’m very grateful. What a great little tree! Merry Solstice and Blessings throughout the coming year. I just love these little Cryptomerias. They’re so unique. Solstice Greetings to you as well and a Happy New Year! Just beautiful + perfect for this time of year! Merry Christmas to you , and a Happy New Year…spring will be even closer when we get to January! Egualmente, Dan. I love your new word – the “Soular panel”! What a great concept for a greenhouse! It’s a great place to recharge and enjoy the plants in their new lives. Very healing… I hope you can build one for yourself one day soon.